25 minuutin päässä Glasgow'n kansainväliseltä lentokentältä ja maailmanluokan golfkentiltä. Historiallinen Blair Estate Ayrshiressa, sijaitsee 250 hehtaarin muinaisesta metsistä, puistoalueista ja yksityisistä puutarhoista. Lähellä monia maailmanmestaruusturnauksia Etelä-Skotlannissa, mukaan lukien Dundonald Links, Royal Troon, Prestwick ja Trump Turnberry. Blairin ylellinen East Wing on nyt saatavana Self Catering -periaatteella ja mahtuu 10 vierasta viiteen kauniiseen makuuhuonetta ja viisi kylpyhuonetta, suuri oleskelutila, jossa on 52 "Sony-TV, suuri perheen keittiö ja ruokasali. Jos haluat saapua toiseen päivään kuin perjantaihin, ota yhteyttä. Sopii perheille, ystäville, golfareille ja niille, jotka rakastavat maaseutua ja puutarhoja. Kaikki kylpyhuoneet ovat hyvin varustettu fluffy pyyhkeet, ylellinen kylpyhuone mukavuudet ja runsaasti kuumaa vettä. Vauvan kylpyamme vauvoille. Voimme järjestää Spa-hoitoja kylpylässä 20 minuutin matkan päässä Blair Estateista. Country Sports - Ammunta / Metsästys / Savi Pigeon Shooting jne voidaan järjestää lähistöllä. On mahdollista järjestää aktiviteetteja maatilalla e. G .: Mini Highland Games, Falconry jne. This looked gorgeous online, but pulling up to this location was just mind blowing. The 250 acres of gorgeous wildlife, nature and soft hills was beyond picturesque. All rooms had the most comfortable beds, everything was cosy and the kitchen had everything we needed. I booked this place as a surprise 30th for my partner and it couldn't have been more perfect as well as affordable. I just wish it never came to an end! Thank you, Sallie. I hope to come back. Thank you again for your great review. You were the perfect guests and left everything immaculate. You are welcome back anytime! A perfect place to enjoy our family Christmas . Exceeded all expectations. Blair House is stunning property equipped to the highest standard . It is set in the most beautiful grounds in which we enjoyed daily walks with our family . It was exceptionally comfortable and from the moment we arrived we were able to completely relax and enjoy the wonderful ambiance Sallie had created . We wouldn’t hesitate to recommend this property to anyone wishing to visit Scotland and we look forward to returning again soon . Thank you once again to Sallie and Charles for your warm hospitality. A most stunning setting matched by a unique history make Blair House such a special place. You can walk for hours and at each turn you think the setting can't get better, but it does. You are surrounded by rolling hills with grazing sheep or cows, stone walls, flower gardens bursting with magnificent colors. If you love luxury and history, rooms filled with gorgeous furnishings and art work, and a sense of history that honors its roots you'll love this place. Everything from booking to check in was made very easy by Sallie. Sallie has thought of everything, and I mean everything. The space in unparalleled. Our family group of 5 each had their own bedroom and bath. Words do not do this gorgeous space justice. We thoroughly loved our time in your home and around Dalry. The train into Glasgow is only a mile away and Sallie went out of her way to make our stay wonderful in every way. There are excellent restaurants near by, as well. Thank you Sallie for your exceptional hospitality and for going out of your way to make our stay a once in a lifetime experience. That being said, we all are eager to return. Memories that will last a life time! No words express how absolutely marvelous is the Blair Estate. We brought our entire family to Scotland to celebrate our family heritage, my parent’s 60 th wedding anniversary and the engagement of the favorite grandson (the only one). Immediately, we felt welcomed and at home. We enjoyed the kitchen and dining room each morning and evening as we ate and laughed together. The five bedrooms were perfect for the 9 of us. The five bathrooms were even more perfect! It is impossible to appreciate this 900 year old estate with pictures (we tried). The gardens and lawns are out of the fairy tale books with flowers and shrubs and manicured grounds. In the distance, sheep are grazing. We loved exploring the paths and felt as if we were in a living history lesson. Walking to the train station, there is a quiet one lane road with arches of mature trees. We could imagine people riding in with carriages and horses. Will S., the amazing caretaker and gardener, spent time explaining the gardens and trees. My 87 year old father considered him as one of his friends when we left. Thank you Sallie, for this phenomenal opportunity to celebrate our family! Our entire group, which consisted of five adults and two children, felt like royalty at Blair Castle! We will probably never forget the first sight of the castle upon driving up and the realization that the castle would be our home for a few days! The grounds were impeccably maintained with beautiful flowers in abundance. The bedroom accommodations were luxurious and extremely comfortable. The kitchen was stocked with all of the essentials as well as thoughtful extras that were so much appreciated. Sallie, the property manager, went above and beyond to make sure our stay was comfortable and her communication before and during our stay was world class. 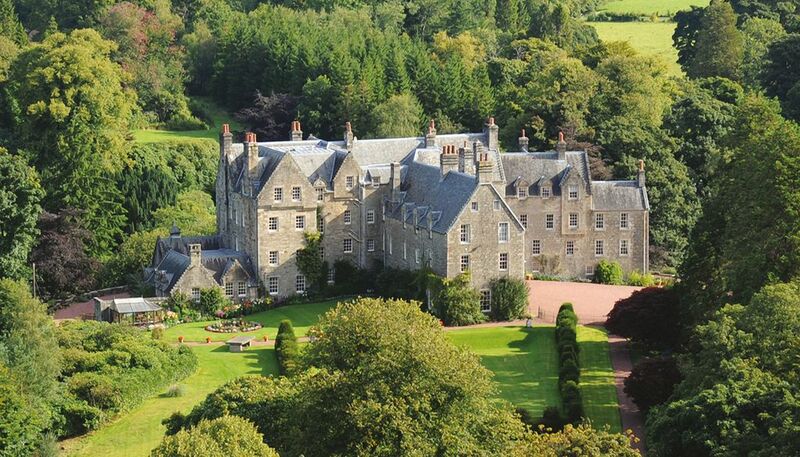 If you have ever dreamed of a fairytale stay in a Scottish castle Blair will not disappoint. The only disappointment was that our stay couldn't be longer! Thank you Sallie and Charles for opening your castle to us! We hope to be back soon! On monenlaista toimintaa tehdä Ayrshire ja ympäröivät alueet.